Bugsy (Tsukushi in original Japanese language versions) is in charge of the Hive Badge, and resides in Azalea Town. He is an expert on Bug-type Pokémon. His name derives from the word bug. In the anime, Bugsy is a fairly nondescript gym leader whose gym is a large greenhouse dome with a forest-like interior. His motto is "Whoever learns the rules of the Bug Pokémon learns to rule the Bug Pokémon", and his signature Pokémon is Scyther, which he has specifically trained to counter fire Pokémon. His other Pokémon are a Spinarak that specializes in String Shot, and a particularly hard and hard-hitting Metapod. When Ash challenges Bugsy's Pokémon Gym, Ash's relatively inexperienced Cyndaquil fails to defeat Spinarak. Ash's Chikorita succeeds, but in turn is defeated by Bugsy's Metapod. Pikachu finishes off Metapod, and in the end, Cyndaquil comes back to defeat Scyther, winning Ash the Hive Badge. 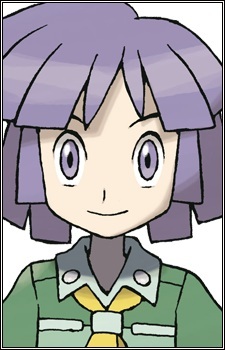 In Pokémon Adventures, Bugsy is an androgynous-looking archaeologist investigating the Ruins of Alph and the Symbol Pokémon. His signature Pokémon is a Heracross, supplemented with a Metapod. He later acquires a Kakuna and Scyther. He also has a special method of catching Pokémon, one which was invented by him and Kurt, the Poké Ball master. Bugsy has an external capture net attached to his Poké Ball, so when he traps the Pokémon inside the capture net it is automatically sucked into the Poké Ball. If the Pokémon manages to escape from the Poké Ball, it will still be trapped inside the external capture net and thus will still be unable to break free completely. However, when Bugsy faces Suicune his efforts to fight the legendary Pokémon head-on fail as his Heracross's strength falls to the much-stronger Suicune. Eventually Bugsy tries to use the capture net method to capture Suicune, but Suicune manages to break Bugsy's net for the first time, and escapes. Later, he is defeated by Sabrina in the Gym Leaders' Challenge.